Featuring an ultra-durable construction and corrosive-resistant black TiNi finish, the SOG Fp6 Field Pup II Black Tini Knife is a beautiful addition to any knife collection. 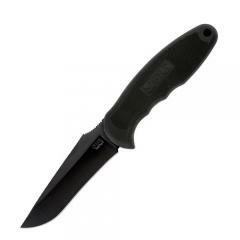 A powerful fixed blade, made from a single piece of 7Cr17MoV steel, employs a full length tang to offer the strongest construction possible. A forward thumb rest provides additional leverage capabilities for increased power and control when applying downward pressure. Designed for tactical use, the contoured Kraton handle provides a comfortable hold while textured inlays deliver a reliable grip in all weather conditions. A premium leather sheath allows the Pup II to be carried anywhere with style and comfort.